Concrete Floor Coatings Market size was more than USD 850 million in 2015 and is estimated to witness growth more than 7% over the projected timespan. Robust growth in the construction industry, including both residential & commercial, across the globe is the major factor propelling the concrete floor coatings market size by 2024. The overall construction spending in 2013 was roughly around USD 7 trillion and is likely to exceed 13 trillion. Increasing government investment to improve their public infrastructure along with numerous upcoming residential projects will positively influence the product demand in the near future. In addition, the global flooring industry is forecast to expand at over 7% CAGR from 2016 to 2024. This in turn will stimulate concrete floor coatings market size by 2024. The product is widely used in the business to provide resistance against wear & tear, harsh climatic conditions and abrasions. Elevating remodeling and renovation practices in North America and Europe will further complement product demand. Major raw materials used in the industry are petrochemical are derivative. Thus, oscillating crude oil prices may hamper the global concrete floor coatings market size in the coming years. In addition, prevalence of government regulations regarding safety and product application in sensitive areas such as food processing and pharmaceutical laboratories may hamper the overall business growth. The industry share contributors are involved in extensive R&D to introducing bio-based concrete floor coatings market, which will create new industry growth avenues in the coming years. Epoxy concrete floor coatings market share led the overall industry and accounted for more than 50% of the overall business size in 2015. The product is forecast to witness prominent gains in the coming years on account of its widespread applications across industrial (pharmaceutical, electrical & electronic) and public infrastructure such hospitals, airports and railway stations. The product also used in residential areas (parking, staircase). Superior product characteristics such as superior resistance against impact, chemical and abrasion makes them suitable to find widespread applications across aforementioned industries. Furthermore, comparatively low cost of the product makes it widely preferred in the industry. Polyaspartics concrete floor coatings market share is likely to observe growth close to 7%. These coatings provide decent features along with superior resistance against harmful UV radiations, which makes it preferred for outdoor applications. Polyurethane concrete floor coatings market size is likely to observe prominent gains due to development of bio-based polyurethane for coating applications. In addition, favoring government regulations for usage of bio derived raw materials for coatings applications will positively boost the global concrete floor coatings market size by 2024. The global concrete floor coatings market share for outdoor applications shall experience growth close to 6.5% from 2016 to 2024. Increasing government investment to enhance their public infrastructure has substantially propelled the product demand across the globe. For outdoor applications, the product is widely used across walkways, pathways, garages and driveways. It helps in increasing durability and strength. Indoor applications led the global concrete floor coatings market size in 2015. Increasing residential, commercial and office space construction projects will stimulate product demand in the coming years. In addition, growing consumer awareness towards flooring solutions will further complement product demand for indoor applications by 2024. Development of sports infrastructure across the globe will positively influence the product demand for indoor applications. North America led the overall concrete floor coatings market share and accounted for more than 30% of the overall industry volume in 2015. Upcoming construction industry in the region post 2008 economic downturn has positively influenced the product demand. Increasing renovation and remodeling practices, particularly in the residential construction sector, has propelled the regional product demand in the recent years. Prevalence of robust end-user industries including automotive, food & beverage and pharmaceutical will boost product demand for flooring applications. Asia Pacific is forecast to experience maximum gains close to 8% CAGR by 2024. Escalating construction industry in China, India and Japan is analyzed to be the major factor propelling the regional concrete floor coatings market share in the coming years. Growing population along with improving consumer lifestyle dynamics has positively influenced the product demand across various industries for indoor as well as outdoor applications. Furthermore, increasing manufacturing facilities set up in the region due to government investment in upscaling their manufacturing business will complement product demand by 2024. Additionally, FMCG, elevating automotive, food & beverage and pharmaceutical sector in the region will subsequently stimulate product demand in the near future. 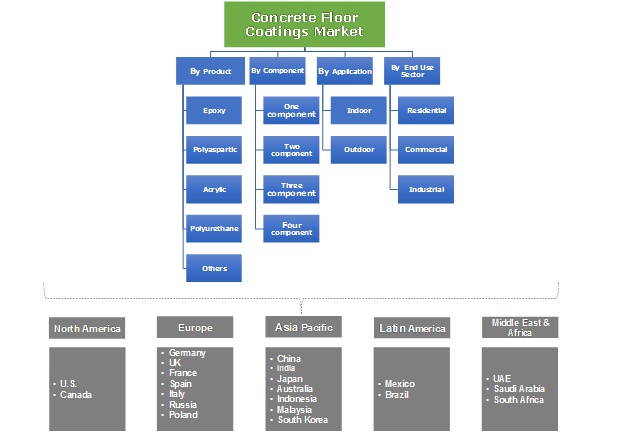 Concrete floor coatings market share is competitive due to significant number of large, medium and small scale manufacturing companies across the globe. Key industry share contributors include BASF SE, Royal DSM N.V., DAW SE, PPG Industries Inc., Nippon Paint Co. Ltd., RPM International Inc., Behr Process Corporation, The Sherwin-William Company, The Valspar Corporation, Sika Corporation, Epmar Corporation, Henkel Corporation, Vanguard Concrete Coating, Rodda Paint Co. and The Stonhard Group. Major product manufacturers are into long term procurement contract with the end-user industries such as construction, as the industry commonly requires bulk purchase. This helps in expanding the company’s presence across the industry ecosystem. Few major manufacturers such as BASF and Sika have presence across multiple stages of the industry ecosystem which helps them in achieving competitive advantage in the business. In addition, the product manufacturers are involved in extensive R&D in order to develop products from bio-based raw materials, this helps in creating promising future growth opportunities. Concrete floor coatings are majorly used across various industries such as construction (both residential & commercial), automotive, pharmaceutical, chemical, food & beverage, electronics and sports for indoor and outdoor applications. It offers resistance against wear & tear, abrasions, chemical, high impact and from harsh climatic conditions. Thus, increasing infrastructure spending across the globe will positively influence the product demand, thereby boosting the concrete floor coatings market size by 2024. Epoxy led the overall industry in 2015 on account of its widespread applications across abovementioned industries. In the same year, indoor applications accounted for the maximum industry share due to increasing consumer awareness regarding floor coating solutions.